This week's Clean & Simple Challenge on Splitcoast is a color challenge: shades of pink, green, blue, and white or vanilla. If you decide to play along, you also have the option of throwing brown into the mix. Now, I must admit that this is not my usual color palette, so this was a bit of a challenge for me. And...it didn't help that when I sat down to stamp on Friday night, I made cards for next week's challenge by mistake. Good thing I checked my challenge list this morning! LOL! I have to say that I REALLY like this card! I think the bold, bright colors work really well together...and it's just fun to look at. I combined Melon Mambo, Old Olive, Pretty in Pink and Tempting Turquoise - crazy, I know, but it works! I was inspired by a card I saw in the current SU! Idea Book & Catalog using the same set (Holiday Blitz) but featuring different stamps (see pg. 44 of the catalog to see the original card). The hardest part about putting this card together was getting all of those hearts lined up just right - my Stamp-a-ma-jig (SAMJ) got a nice lil' workout. I especially like the ribbon with the button accent - SO cute! Hop on over to the Clean & Simple challenge forum to check out the other design team samples and play along. 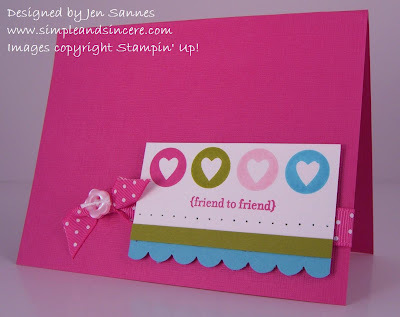 Love these bright colours together and super layout - a great CAS card! Great color combo (the perfect amount of Old Olive and Tempting Turquoise)and your card turned out so pretty! !